My garden, a bit of choccy and a good chat over a coffee! Finding seeds in my grapes, killing off my houseplants and spending time with Henry (surname: Hoover). Why ‘Mother & baby yoga’? I qualified as a yoga teacher whilst living in India back in 2005 and have enjoyed a self-practice in various forms ever since. I’ve also taught for many years as a tutor in ‘Childcare & Education’ fuelled by my personal interest in children and how best to take care for their needs. 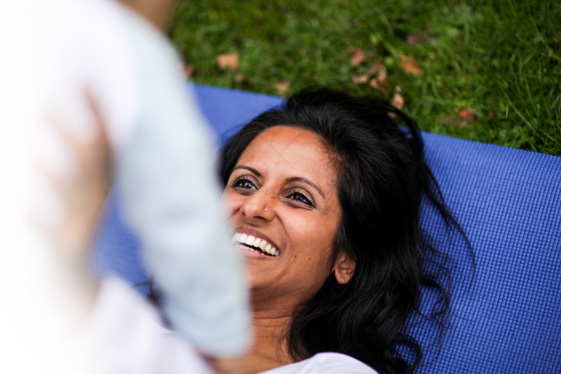 To be honest, a merging of these two areas of my life was just crying out to happen – hence the birth of Yoga mums. Did I also say that I’m a mum too? I’ve got two young great boys, Ro who is 7 and Temy who is 8 months. There’s also Toby, but he’s 35 and doesn’t quite count – he’s my husband!